Towels are not available. Sorry, this property does not accept pets. 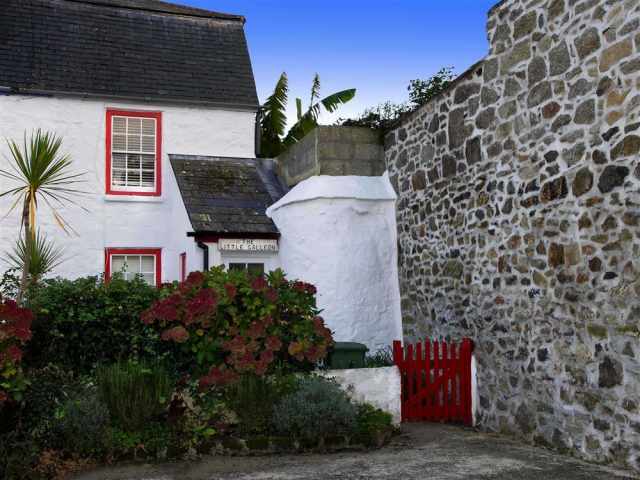 Within a 15 minute drive of the golden sandy beaches of the Camel Estuary and only 4 miles from the fishing village of Port Isaac, this detached, double glazed stone and slate barn has been beautifully converted from a 400 year old corn mill. This fascinating inverted barn conversion retaining parts of the original mill wheel is set in a large country garden offering total seclusion with lovely countryside views; Barley Moo is set below Pollingarrow Farm near the picturesque village of St Kew. The village of St Kew, just over half a mile away, has a quaint old pub offering good food and a pretty 15th century church. St Kew Highway has a pub, garage and mini market less than a 5 minute drive away. There is also a 9-hole golf course with driving range and farm shop 1 mile away. For a wider selection of amenities, the market town of Wadebridge is 3 miles with a leisure centre, cinema and bicycle hire to explore The Camel Trail. The golden sandy beaches of Polzeath, Daymer Bay and Rock are all within easy driving distance, the latter also providing a foot ferry across the estuary to Padstow. Approached by a narrow unmade lane and gated gravel driveway with parking for several cars, four steps lead up to a unique railed bridge and a couple of further steps continue up to the entrance at first floor level. The front door opens to a delightful oak floored sitting room with beams rising up to the apex of the roof, comfortable lounge seating and far reaching views across the fields from French Windows that open inwards with a Juliet balcony. To one side is a fully fitted kitchen/diner with a low half-glazed door leading out to a timber railed balcony which extends around two sides of the mill with views of the surrounding unspoilt countryside. A cloakroom W.C. with hand basin completes the first floor accommodation. Carpeted stairs lead down in one corner of the living room to a ground floor hallway with the original slate flagstones and two charming bedrooms each with an en-suite shower room W.C. with hand basin and heated towel rail. The master bedroom has a 5ft double bed and French Doors opening to a slate paved patio edged with granite rollers from the bygone days. The second bedroom has two single beds and a glazed door set beneath a lovely oak lintel leading out to a small terrace with trickling stream. There are wall mounted electric convector heaters in all rooms. The grassy garden which surrounds the property is ideal for older children to let off steam however young children will require supervision as there are some changes in levels and the adjoining fields may contain livestock.